Though lightweight, corrugated pallets are strong and durable (most rated for up to 2000 pound capacity) and are ideal in applications including consumer paper goods and products, snack food, bottle manufacturing, foam fabricating, plastics manufacturing and POP displays. These pallets are cost effective as cardboard and paper products are cheaper than wood and plastic, and they are also cheaper to ship due to reduced weight. Corrugated pallets are completely recyclable, which means avoiding landfill fees while, at the same time, helping companies reach sustainability/green goals. The elimination of staples, nails, nuts and bolts not only results in a light weight and easily recyclable product, but also reduces workplace injuries for employees and customers alike. The absence of nails and like materials also lowers the potential for damage to the product and storage areas such as floors and racks. These pallets also tend to have better shock and vibration absorption, better air circulation, and are can be easily customized to meet specific requirements. Some other benefits of corrugated pallets include safer and cleaner handling as bugs and mold are no longer an issue. Most of these pallets are supplied with coatings that do not affect recyclability while offering additional strength and water resistance for durability in humid conditions. The most desirable feature of corrugated pallets is their aforementioned light weight, which means shipping more product at one time is more likely. Workers can also maneuver and carry multiple empty pallets without the use of a forklift and stacking multiple pallets poses no safety hazard. Fuel use is reduced both inside the warehouse and in shipping, which reduces co2 emissions overall and means leaving a smaller footprint. Corrugated Pallets Corrugated pallets are 65% to 75% lighter than their wood or plastic counterparts and are made from corrugated cardboard, corrugated fiberboard, laminated paperboard, or paperboard composite honeycomb and include structural reinforcements and spacers for forklift blades. 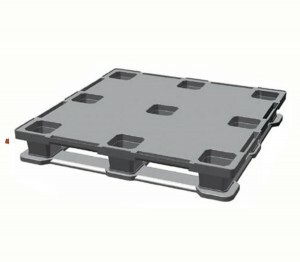 In general, plastic pallets are used for the stocking, stacking, storing, shipping and displaying of various products across innumerable industries.